Electronic beam weld allows for a more powerful bond. Bi-Metal blade increases blade life. Applications: Cuts all metals including non-ferrous, pipe, conduit, stainless and sheet metal. Use with materials 1/16"-3/8" (1.5mm-10mm) thick. Depending on blade TPI. Electronic beam weld allows for a more powerful bond. Bi-Metal blade increase blade life. Use with materials 1/8"-1/2" (3.2-1.3mm) thick. Applications: Composition Materials, Plastic, Pipe, Carbon Steel and Stainless Steel. Bi-Metal blade made with 8 percent Cobalt keeps teeth sharp longer and increases blade life. Use with materials 3/16" (5mm) and thicker. Electronic beam weld allows for a more powerful bond. Applications: Wood and Nail Embedded Wood. Cuts all metals including non-ferrous, pipe, conduit, stainless and sheet metals. Use with materials 1/8"- 1/2" thick. Bi-metal construction for faster cutting and added durability and precision set teeth for faster, smoother cuts. Electronic beam weld allows for a more powerful bond. Bi-Metal blade increases blade life. Applications: Cuts all metals including non-ferrous, pipe, conduit, stainless and sheet metal. Use with materials 1/16"-3/8" (1.5mm-10mm) thick. Depending on blade TPI. Tooth design utilizes sharper tooth geometry for faster cut rates. Aggressive shank angle increases tooth contact, maintaining cutting speed as blade wears for longer blade life. Anti-stick coating minimizes friction and gumming. Electronic beam weld allows for a more powerful bond. Bi-Metal blade increases blade life. Applications: Cuts all metals including non-ferrous, pipe, conduit, stainless and sheet metal. Use with materials 1/16"-3/8" (1.5mm-10mm) thick. Depending on blade TPI. Fits all universal shank jigsaws. Very smooth cuts in wood up to 2". Bi-Metal blade made with 8 percent Cobalt keeps teeth sharp longer and increases blade life. Use with materials 3/16" (5mm) and thicker. Electronic beam weld allows for a more powerful bond. Applications: Wood and Nail Embedded Wood. Tooth design utilizes sharper tooth geometry for faster cut rates. Aggressive shank angle increases tooth contact, maintaining cutting speed as blade wears for longer blade life. Anti-stick coating minimizes friction and gumming. Reinforced tooth for increased durability when cutting through nails and other foreign objects. +6 degree hook angle for fast, aggressive cuts. Anti-stick coating minimizes friction and gum up. Raker tooth design increases the tooth contact area for faster cuts. 1/2" universal shank. Cuts Wood, Embedded Nails, Cast Aluminum, Plastics, Light Gauge Non-ferrous Metals & Fiberglass. Electronic beam weld allows for a more powerful bond. Bi-Metal blade increase blade life. Use with materials 1/8"-1/2" (3.2-1.3mm) thick. Applications: Composition Materials, Plastic, Pipe, Carbon Steel and Stainless Steel. Cuts composition materials, plastic, pipe, carbon steel and stainless steel; use with materials 1/8" and thicker. Bi-metal construction and electronic beam weld for stronger, longer lasting teeth. Tooth design utilizes sharper tooth geometry for faster cut rates. Aggressive shank angle increases tooth contact, maintaining cutting speed as blade wears for longer blade life. Anti-stick coating minimizes friction and gumming. Optimized for specific application. Shatter resistant for flexibility and durability plus long blade life. Applications: Structural Steels 1/16" to 3/16" thick and Non-Ferrous Metals 1/16" to 5/16". T2 Technology a revolutionary new blade design that delivers up to 100 percent longer blade life and 25 percent faster performance in metal cutting applications. Matrix II type alloy high speed steel with 8 percent Cobalt cutting edge. Precision milled teeth. Universal shank. Applications: Contour cuts in metal 1/16" to 1/8" thick. Taller high speed steel strip reduces breakage and maximizes tooth durability and life. Aggressive shank angle increases tooth contact, maintaining cutting speed as blade wears for longer blade life. Tooth design utilizes sharper tooth geometry for faster cut rates. Specially formulated anti-stick coating minimizes friction and gum-up for smoother cuts. 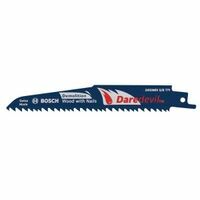 Wood cutting blades engineered to deliver fast cuts, longer life, greater tooth durability and quick plunge cuts. Features Nail guard with an aggressive 5 TPI pattern for faster cuts and a unique design that protects against tooth fracture. Fang tip bites into the wood on first contact. Matrix II bi-metal teeth for greater durability. 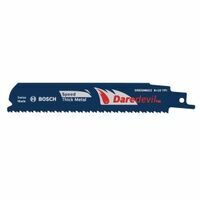 Includes (25) 9'' 5 TPI Sawzall blades. Blade dimensions: 9'' x 3/4'' x .050''. 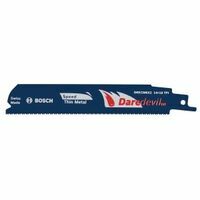 Bosch Reciprocating Saw Blade, Series: Daredevil, 6 in Length, 0.042 in Thickness, 8 + 10 TPI, Micro Blast Teeth, Bi-Metal Body, Blue, Applicable Materials: Metal and Wood With Nails Bosch Reciprocating Saw Blade, Series: Daredevil, 6 in Length, 0.035 in Thickness, 14 + 18 TPI, Bi-Metal Body, Blue, Applicable Materials: Thin Metal Precision set teeth for faster, smoother cuts; 8 percent cobalt keeps teeth sharp longer. Bi-metal construction used for hardiplank, fiberglass and cement board. Optimized for specific application. Shatter resistant, bi-metal design provides the flexibility and durability single-metal blades can't. Applications: Wood, Plastics, & Composites. Optimized for specific application. Shatter resistant, bi-metal design provides the flexibility and durability single-metal blades can't. Applications: Non-Ferrous Metal, Thick Metal, Wood, Plastics, & Composites. T2 technology blade design that delivers up to 100 percent longer blade life and 25 percent faster performance in metal cutting applications. Shatter resistant, bi-metal design provides the flexibility and durability single-metal blades can't. Applications: Non-Ferrous & Medium Metals.